Regular readers may have noticed that I haven’t mentioned Climate Change for quite a while. It hasn’t gone away, there is no sign of it slowing and we don’t know precisely when the tipping point will occur. The predictions have been for 100 – 150 years in the future, longer than anyone alive today will see, which is probably why it is so difficult to sell the idea that we really need to decarbonise now. There are reports that Climate change is advancing much more rapidly than previously thought (The Independent) and only this past week all-time heat records have been set all over the world (Washington Post). But there is a much more immediate and present danger, which by and large is being ignored in the corridors of power and the mainstream press (there are no votes or profit in it), and I’m not talking about the threat of nuclear war or Brexit. We are on the very brink of the sixth major extinction event in this planet’s history (The Guardian). Life on this planet is a complex web of interaction and dependency and we are a part of it, the part that is destroying it. Such events do not come without warning signs, you just have to recognise them and understand what they mean - and you don't need to be a scientist to do it. In just one year the world has lost an area of tree cover the size of New Zealand (Mongabay). Trees and vegetation are not only an air-conditioner for our atmosphere, that’s the air we breath, but are also host to an abundance of life that we ultimately rely on for our own continued existence. 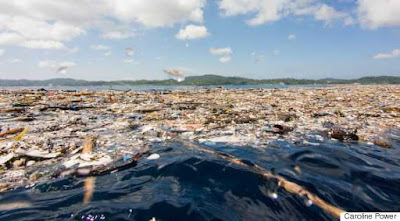 Our oceans have become seas of plastic waste and we still expect to be able to fish them (Inhabitat). And the fish we are catching now have been contaminated with that plastic. We’re eating plastic. "We are treating the symptoms, not the disease. As a country, as a species, as individuals we need to stop consuming single use plastics" explains Caroline Power. Have you noticed how your windscreen doesn’t get splattered with bugs any more? (The Telegraph) You might think their absence is a bonus until you realise they are an integral part of the food chain that feeds us, and a chain is only as strong as its weakest link. We sit in front of a computer screen, tablet or mobile, and complain when travellers dump our own rubbish in our own neighbourhood. Yes, it’s our rubbish, one or more of us paid them to do it. And yet we are all complicit in the wilful destruction of the wider environment, the very environment that is our own life support system on this lonely spaceship we call Earth. Still it’s not all bad, England have won a football match by way of a penalty shootout. Now that is “unexpected”. Children are not being taught about dumping rubbish in the streets - why don't schools arrange for them to go out with their teachers to pick up from the pavements in the Borough (as is practised elsewhere in the country). It's a start!